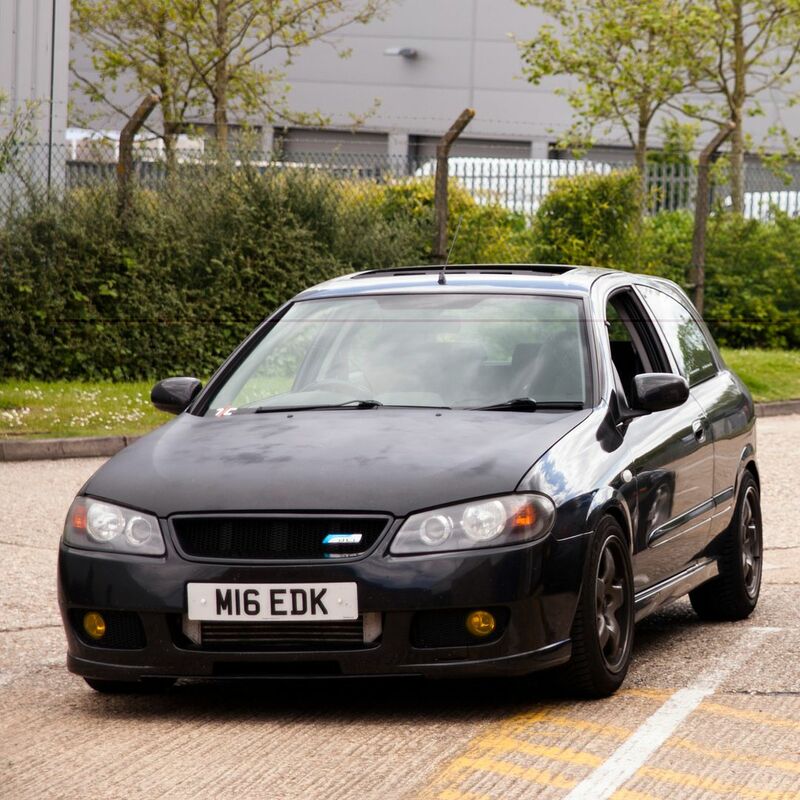 The project started with a 2003 Nissan N16 Almera SXE DCi in Techno Grey, and now lives in the form of a 2004 Pearl Black version of the same car. 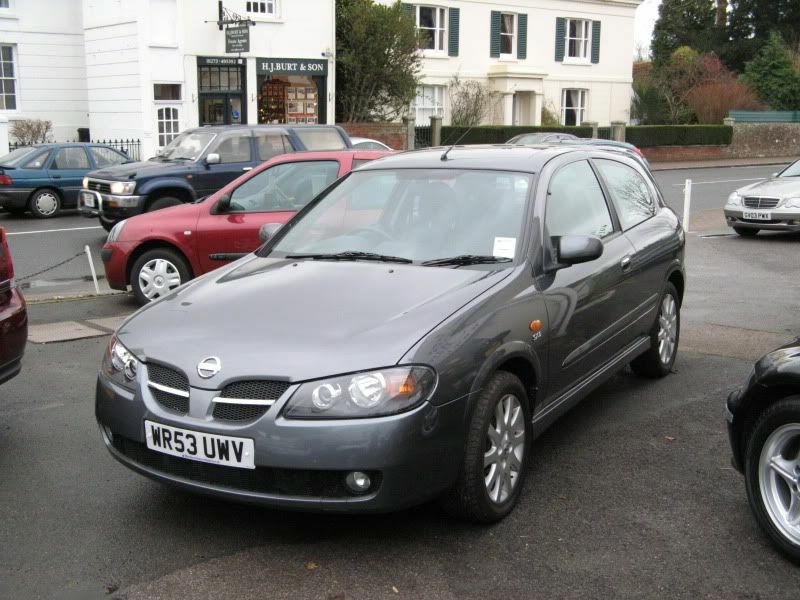 Previous car: 2001 N16 Almera Activ 5dr QG15DE, Tornado Grey - Standard. 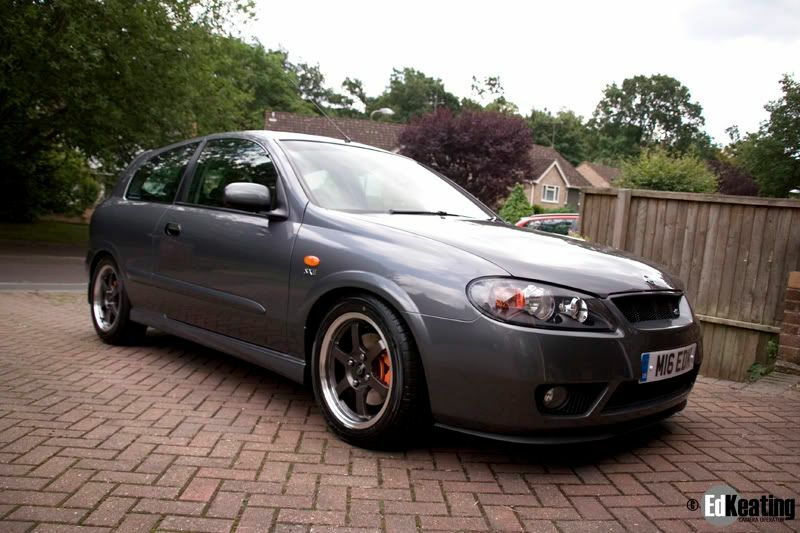 Previous car: 2003 N16 Almera SXE DCi (136) 3dr YD22DDTi, Techno Grey - Modified. 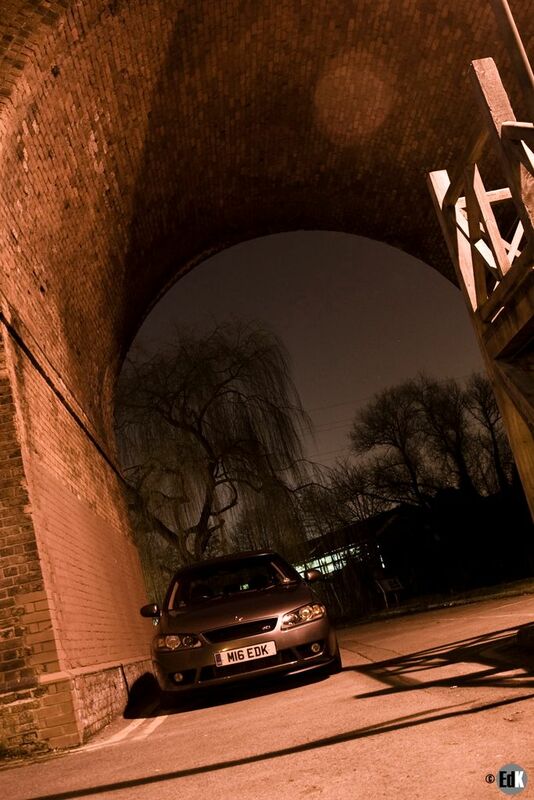 Current Car: 2005 N16 Almera SXE DCi (136) YD22DDTi, Pearl Black - Modified. 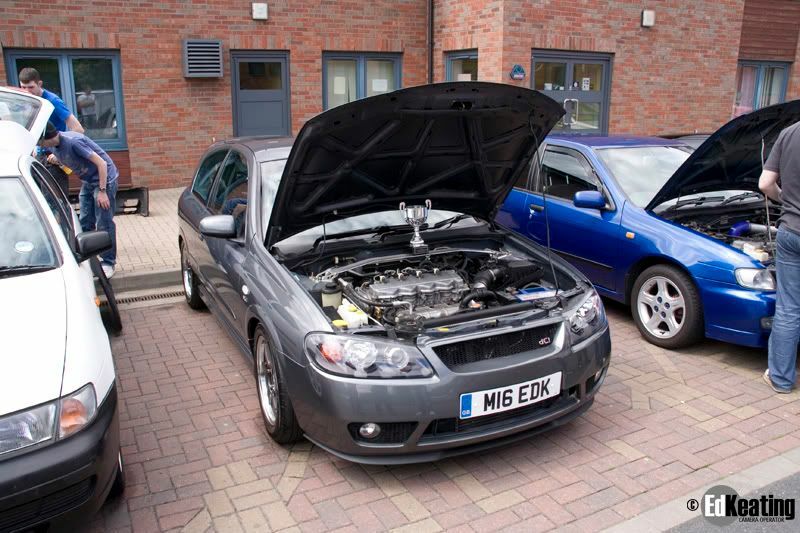 Stock power 136 BHP, 224 Torques. Stock average MPG (real) 43 combined, 55 motorways. Modified average is slighter higher! (unless I use the go pedal too much). YD22DDTi 2.2L commonrail injection turbo diesel. Garret GT1849V turbo. Intercooler. 16.7:1 compression ratio. 6 speed RS6F51R box. Powerspeed (Kent) 2.5" Turbo-back mandrel bent stainless exhaust. Forge Intercooler and welded ali 2" piping. TDi Turbos' Hybrid Turbo GT1856V. HKS drop in air filter. Updated version of Nissan SCV. Nissan B15 SpecV Helical Limited Slip Differential (HLSD). Meister R Zeta R coilovers, 7/6KG. Wishbone castor spacers / anti lift. 2JR Delrin Engine Brace Bushes / anti wheel hop. 2JR Turcite-X Shifter Bushes (yet to fit). 2JR Short Shifter (yet to fit). 2JR Rear Anti-Roll Bar (Nismo replica) (yet to fit). 2JR Bump Steer kit (track rod ends) with McGill Motorsport uprated rose joints. 2JR Roll Centre correction (extended ball joints). 2JR Front wishbone SuperPro poly bushes (95 dm). Rear trailing arm SuperPro poly bushes. Front and Rear ES poly engine Mounts (removed front due to vibrations at idle). TDMi Q-Link for Scott Russell linkage (yet to fit). 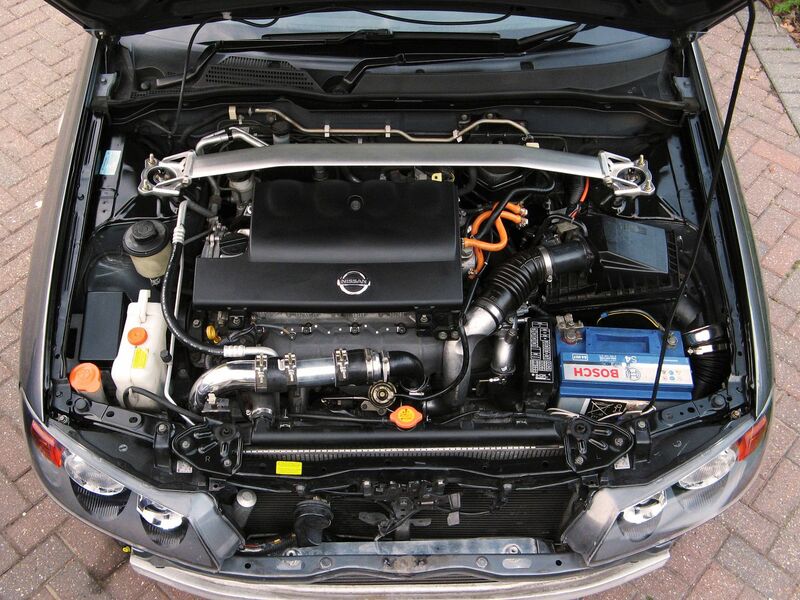 Alutec lightweight (1.5kg) front strut bar. 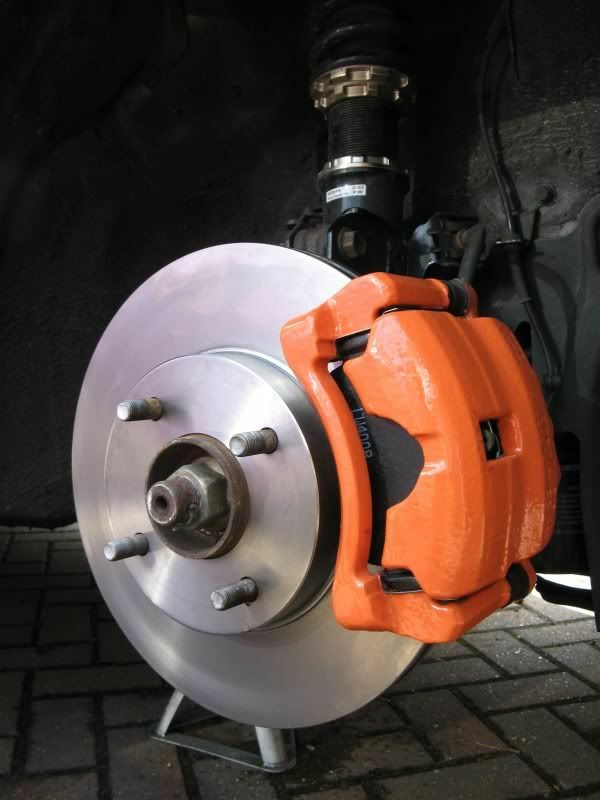 2JR 4 Pot Wilwood 310mm brake kit. HEL braided brake lines, DOT 5.1 fluid. 17x7.5 SSR Hasemi Prot-S alloys with Continental Sport Contact 5/3 tyres , 205/45/17. 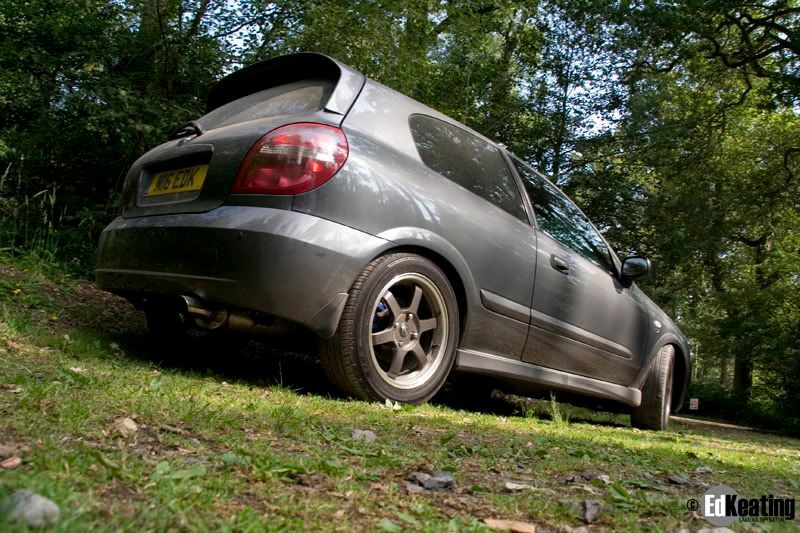 16x8 Enkei Tarmacs with Silverstone Rally Tarmac 'slicks'. 16x8 1989 R32 GTR alloys with 195/55/16 Michelin Alpin A4 winter tyres. 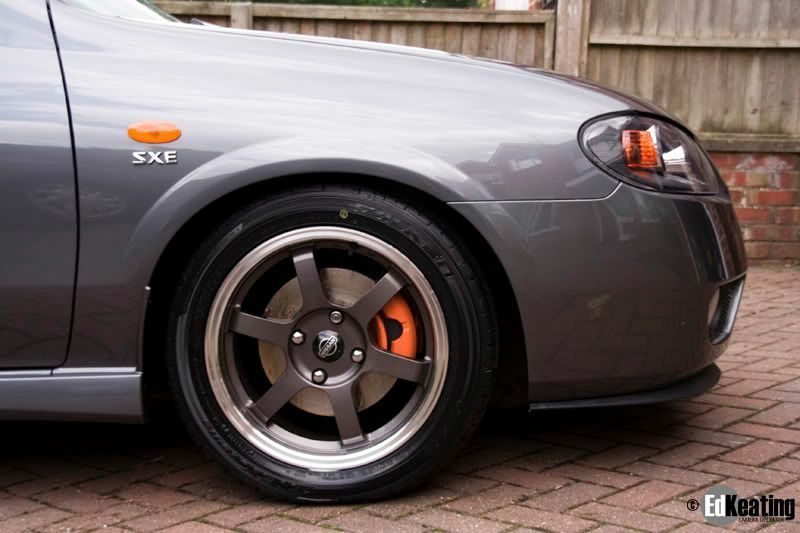 G35 350GT 17" Nissan alloys. Aussie/Jap spec grille, after-market open mouth version. Custom front bumper made from V10, N16 and G10 parts. Custom rear bumper made from N15 and N16 parts. Private plate (was a present from the parents ). Custom car mats, metal footplate and grey piping. Depo OEM replacement headlight upgrade. PLX Multi Gauge with EGT probe. Intake manifold and EGR valve maintained with Wynns EGR aerosol cleaner. KYB Excel-G Gas Struts. SOLD. Koni Sport Yellow adjustable dampers. SOLD. BC Racing BR series coilovers, 6/4KG. SOLD. 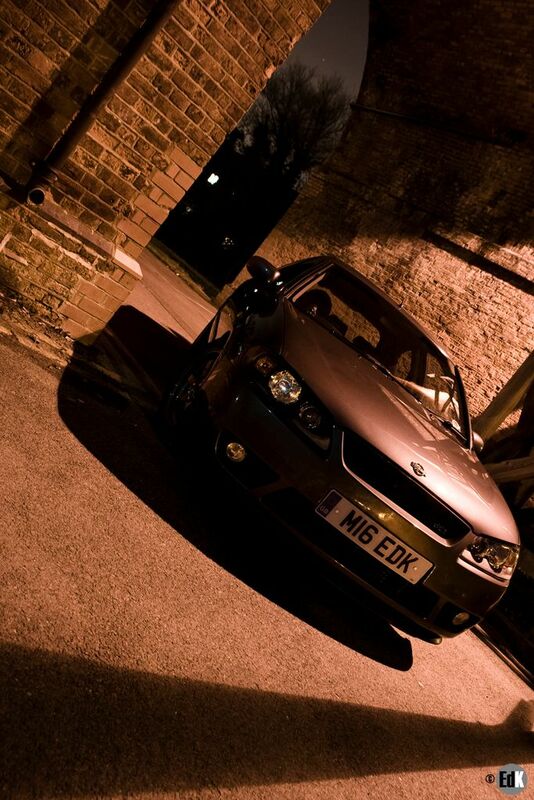 UKDM Chrome grille painted grey. 16" Rota Grid, finished in Nissan KR2 Grey. 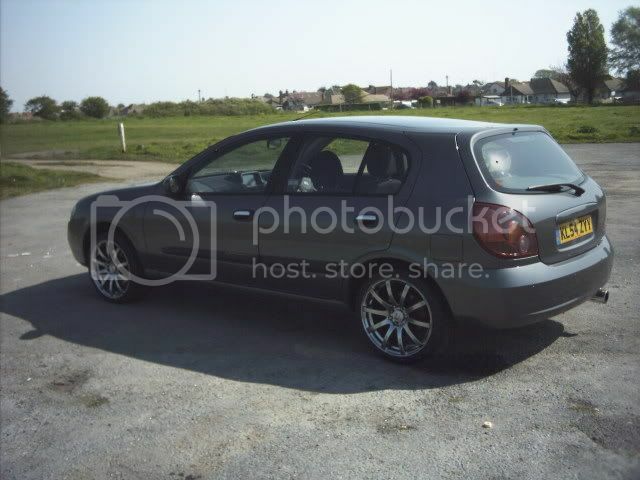 16" Primera GTLE Enkei Nissan alloys in silver. Nissan Maxima twin-pot front brake conversion. Seat Leon Curpa R front splitter. 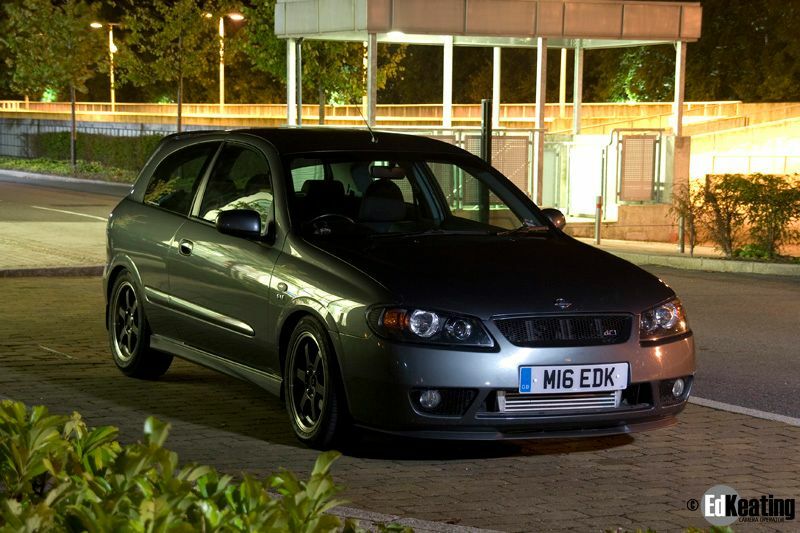 Grey car - Custom front bumper taking design cues from the Australian N16 pulsar, with N16 Pulsar bonnet. Comparison of how it was the day I bought it with how it looks today. A different animal. 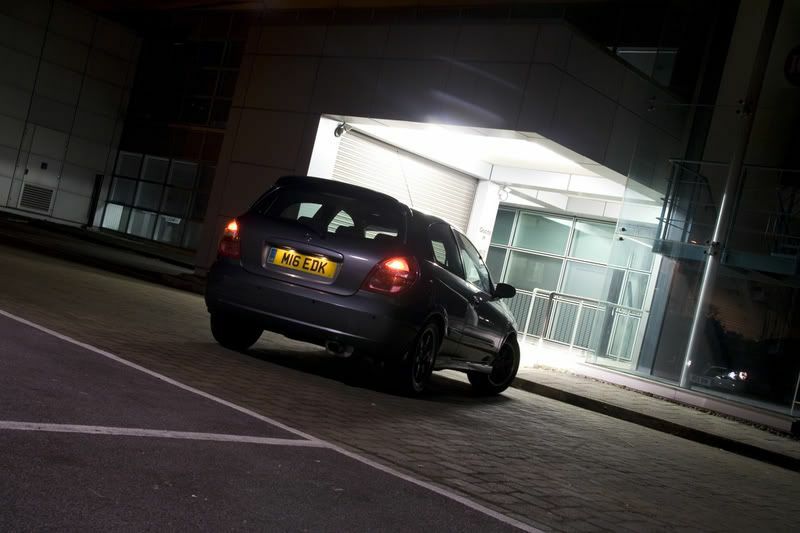 Paint p2 rear lights, or, change for p1 rear lights. Cheers yeah you won't believe how hard it is to find a 3dr techno grey mera, let alone with a 2.2 136. Had to go with this colour though so have just had to wait till one's available. yeah thought about smoking them, think it would look good. Hell yeah I'm taking my clear repeaters right off my 1.5 and they're going straight onto the new mera! That takes me back to when I had my 1.5 SE! Although, smoked repeaters work better than clear ones on the grey. Also, what backbox has yours got fitted? Tis a nice colour Didnt want to buy more repeaters as I've got clear ones already, but i agree, smoked ones do look sweet. 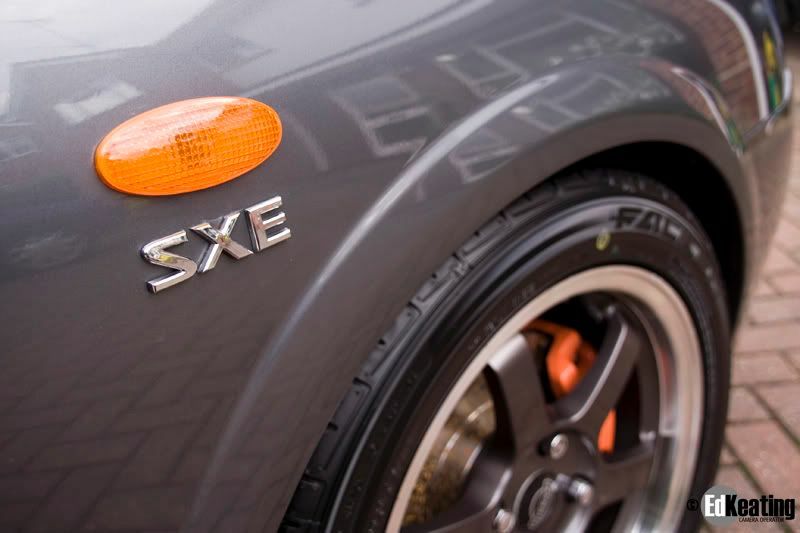 Backbox is standard, the 'chrome' tip is something that comes with SXE models as Nissan consider the SXE the 'sport' model. Not too keen on it myself. A rectangle one that sticks straight out rather than bends down would look better imo. Like the wheels Kei Racing? I think i'd be too scared of kerbing those! look ace!!! 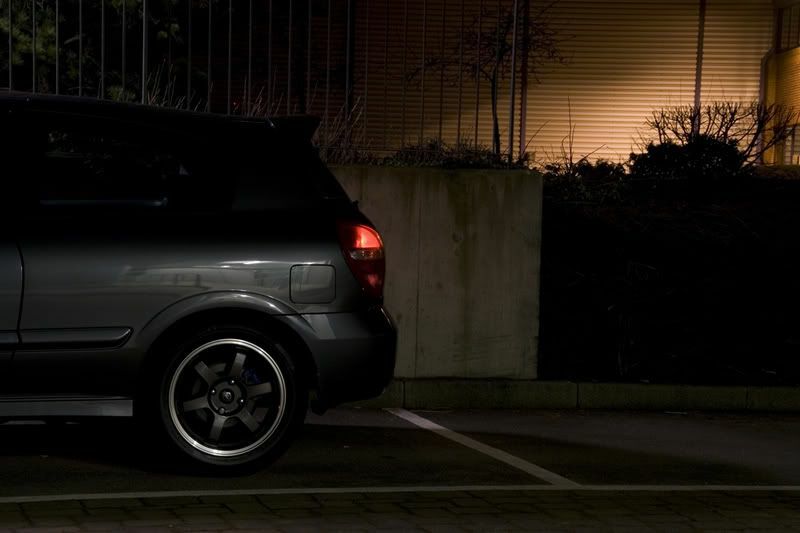 about the fog light tho, the car isnt an import is it?if it was a jap import, as opposed to cyprus etc i t would not have a rear fog light and need one fitted. what are the first three letters of the chassis number? 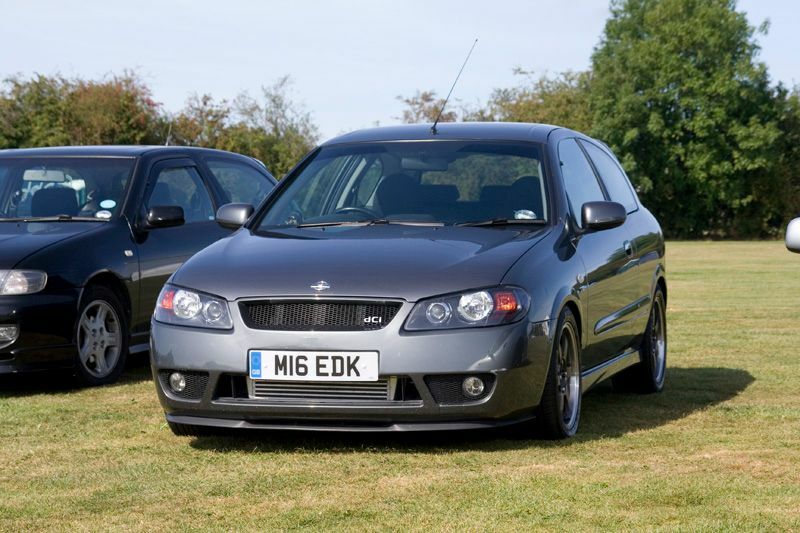 Just had a look and there's a fog light where one should be too, in the right hand rear cluster. Am not aware if this is an import. Thanks Darren. Didnt know the VIN was bad to show actually. Been driving the diesel for a few days now and I've got to say I'm loving it. Hills mean nothing now and overtaking is a breeze! Understeers a lot, maybe more so cause it's been wet. Hoping to fix that with 30mm eibach pros. Next move is to put my clear repeaters on and remove extra fog light. Pics to follow. Having trouble deciding which wheels to go for though. Really like Rota Torques but smallest is 17". Does anyone know how much ride would be affected with 17s? I'm hoping it wont affect acceleration either, but with the dCi's torque I'm guessing not. 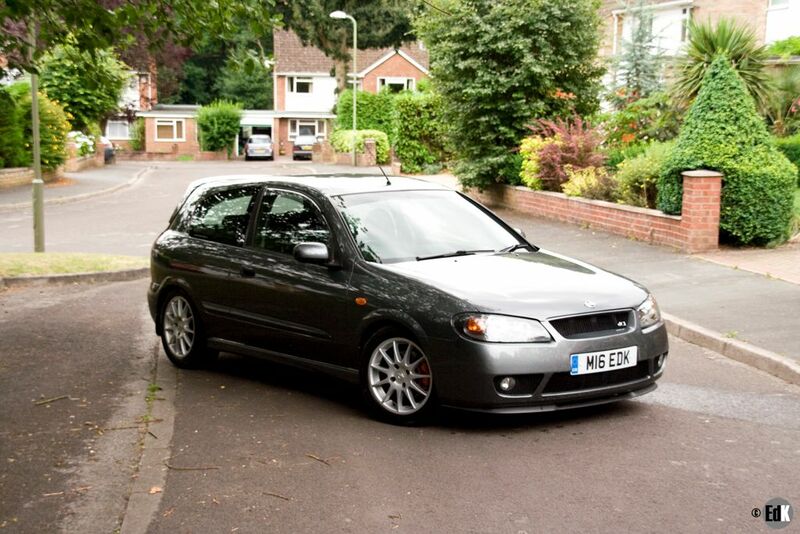 Other option is 16" Rota grids or slipstream. I put my 17's on first then lowered it and then had my 15" steeles back on and once the car has been lowered the ride quality is not that good but with the 17's its even worse. it feels worse for the drive as when I had 17" on stock suspension my passengers could not tell the difference. So likewise, keeping 16" and lowering by 30mm shouldn't be a problem? Just don't do both. I heard brands of spring can vary somewhat, and that Eibach is generally up in the 'good' category. but is Eibach good as in good ride or good for handling. if its good for handling ride quality will be crap if you know what I mean ? the Eibach sportline springs say it lowers the car 45-50 on the front and 40 on the rear not sure how good ride quality you will get lower. 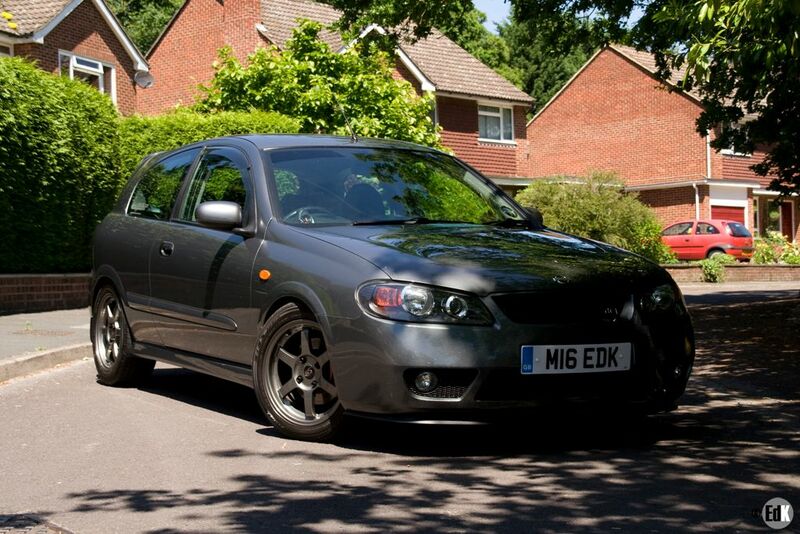 I'll be going for Eibach pros as wanted no more than 30mm. Was thinking they were good from the respect that ride quality is not reduced too much while still offering improved handling. There was a thread a little while back about brands of springs. I think it was in the N15 forum. Hope that helps and if anyone reading this finds im inaccurate then do post up! 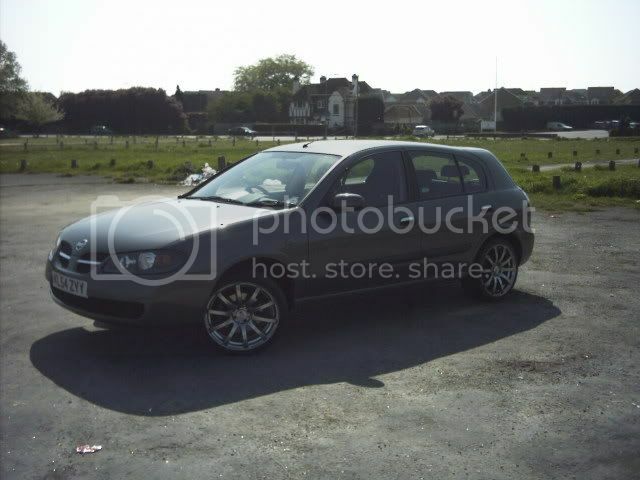 If I remember rightly from when I had mine, the only thing with 17s & 50 profile Toyo Proxes T1s on standard suspension, was that you really felt evey pothole & large crack in the road (but not as bad as the GTi)! But, they did seem to cancel out the (not much to start with) understeer. 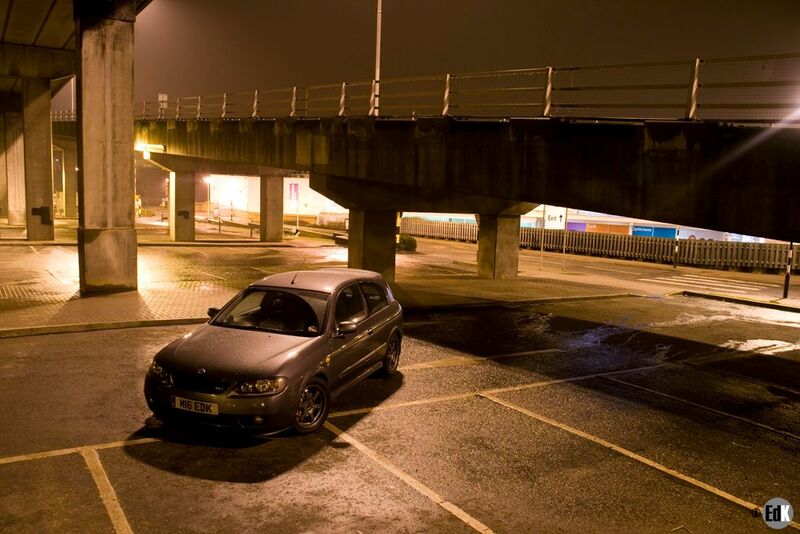 It could be that as yours is the diesel, the front is heavier than the petrol, so is more prone to it. Thanks the advice guys. Understeer from heavy diesel, makes sense now you mention it. Paul, interested in the K Sport group buy. Seems like the right course. 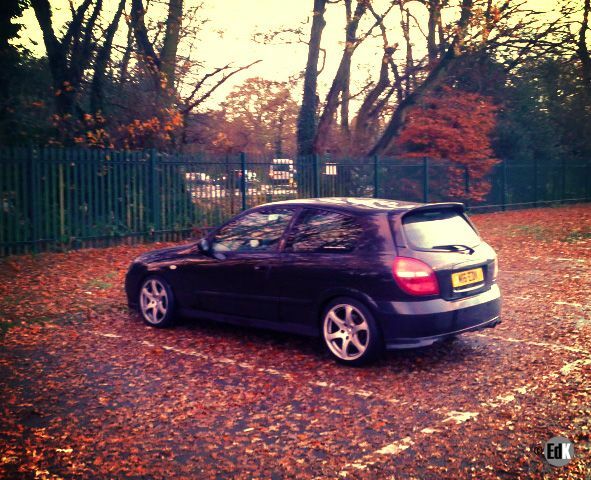 I'd always thought coilovers were at least £700 but with the group buy price I'm in!